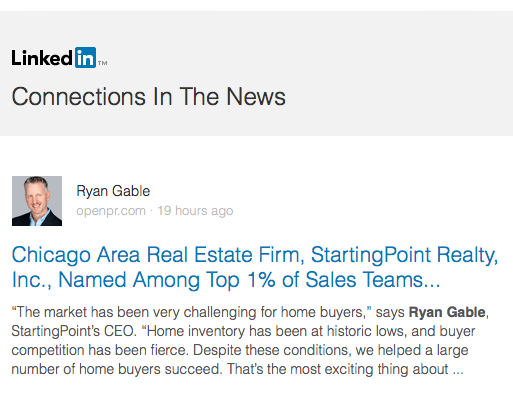 StartingPoint Realty, Inc. stands among an elite group of top-performing real estate sales teams, according to 2017 transaction statistics compiled by REAL Trends and as advertised in the Wall Street Journal. The teams in REAL Trend’s list of “America’s Best Real Estate Professionals” averaged about 147 transaction sides and $62 million in closed sales volume. Less than 1% of approximately 14,000 real estate professionals nationwide achieve this distinction. Since 2004, StartingPoint Realty has specialized in educating and representing first time home buyers throughout Chicago and the Northwest Suburbs. StartingPoint Realty offers free home buyer seminars at various locations in Chicagoland. For more information, call 847-348-1154 or visit www.startingpointrealty.com.